I camped on Mt. Laguna in the hills just east of San Diego, glancing at a weather report and noting a welcoming cooler weather after the 90's in Tucson. I managed though to miss the wind and sleet report. The first night was pleasant with a light cool breeze. Early in the morning I hiked around a huge meadow and explored the edges of the woods. Later in the day I headed to the town of Julian past sections of burned woods and blossoming trees. My only memory from this town of Julian was the old hotel. I recall wishing to return and spend a night. I was pleased to see it looking like I remembered. In hindsight, I should have stayed there. Late afternoon the weather began to turn nasty with a stiff breeze and swift clouds scraping the treetops, I bought a cup of hot coffee knowing that my stove likely wouldn’t light in this wind. Around the corner from the coffee shop pup knocked the coffee from my hands. I retrieved the cup in time to get two gulps. This unfortunate accident foretold the unfortunate night to come. The raucous wind rocked the car and the sleet tapped on the windows waking me over and over with a shudder. The roar in the tall pines was unsettling. Were I to repeat a trip like this one (as Steinbeck says), the second time I would correct the mistakes of the first. I’d read weather reports in more detail. 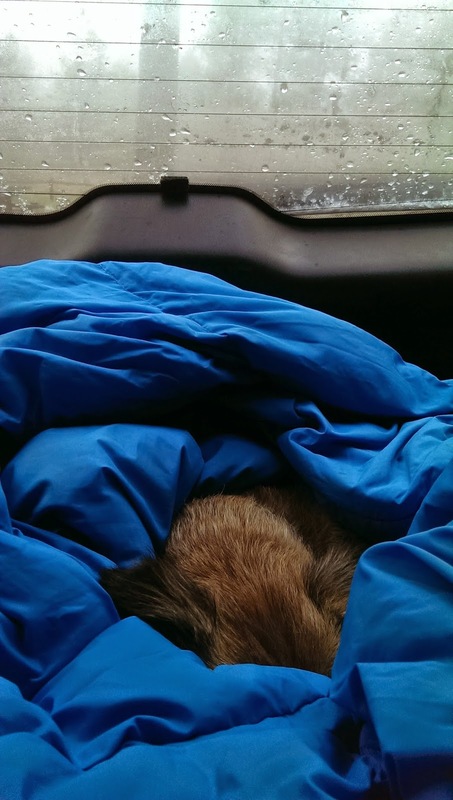 Ice framed the windows of the car and pup snuggled in deeper. 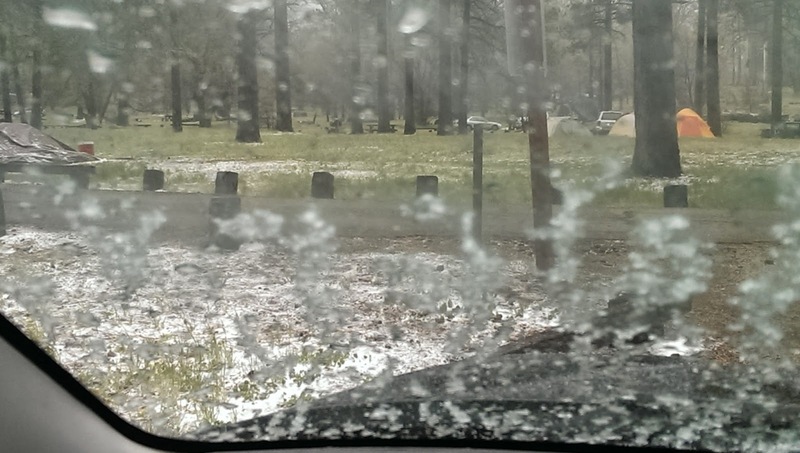 In the morning it was so cold and still blowing so hard that I drove to the campground restroom fifty yards away. Then headed to a lodge for breakfast instead of cooking my own. I had passed a few cafes and stores serving the camping and hiking population. I pulled into the first one with a bright “open” sign in the window. The cook was just unlocking the door, lights still off as a small handful of customers slipped through the door. As I waited while the cook handed-out day passes for hiking to a young couple, the other customer and I struck-up a conversation and eventually we sat conversing over breakfast. Art was hiking the first stretch of the Pacific Coast Trail. He had come in out of the weather for breakfast hoping he could also get a cabin for the night. He didn’t relish hiking in this unpleasant cold snap. The waitress arrived shortly for her shift and told us that a car had flipped on the road just down the hill. Weather for the hardy and cautious for sure. The eggs were marginal and the bacon of the poorest quality. The conversation was good. The morning company made the breakfast feels less like a mistake.